KATHMANDU, May 15: As India treads a fine line between Kathmandu and Madhes, the Madhes-based parties face tough choices on the agenda of the constitution. Rastriya Janata Party Nepal (RJPN) and Federal Socialist Forum Nepal (FSFN), the fourth and fifth largest parties in parliament with roots in Madhesi politics, have been demanding revision to the constitution for “its broader acceptability”. They have made constitution amendment a perquisite for taking part in the government or for forming any tactical partnership with the ruling parties. But Indian Prime Minister Narendra Modi’s conspicuous silence on the issue of constitution amendment, an agenda New Delhi championed in the past, has fueled debate in both parties on “whether to stick to their stance or consider a course correction”. 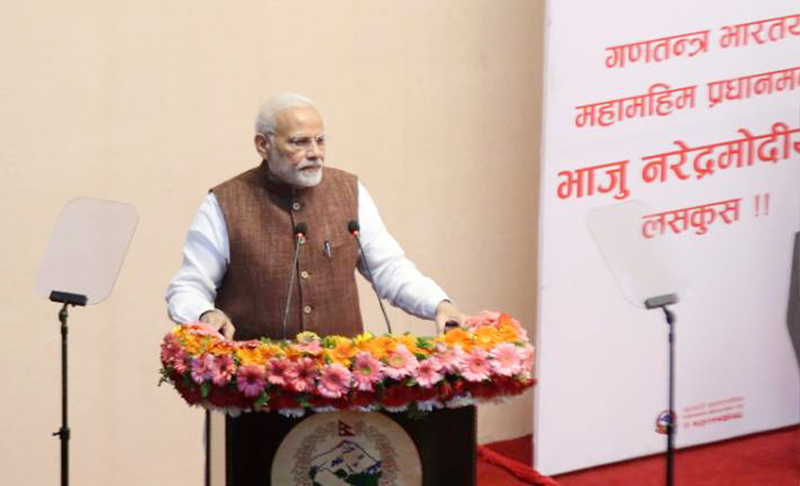 Modi, during his just-concluded two-day Nepal visit, did not make any comment on the constitution, which New Delhi is yet to welcome formally. The Indian delegation maintained its silence on the issue during bilateral talks and meetings with the leaders of various parties here. Modi avoided discussion on the issue during a meeting with them, said a RJPN presidium member present at one meeting . “We conveyed to him our concerns over the constitution but there was no reaction. He suggested to us to work with the other parties and increase our strength,” said the RJPN presidium member. He said Modi suggested strengthening ties with other parties. This gradual change in India’s stance has divided leaders from both parties along two lines. While one group of leaders is for further pushing constitutional amendment, some others are in favour of seeking a milder approach. The first group of leaders insists that they should continue to push for the amendment, regardless of the Indian position. They opine that any compromise on amendment, which was the main agenda during the elections, would draw a backlash from their constituencies. The second group thinks that they should tone down the rhetoric on amendment and increase the engagement with the left parties. Its leaders said there was greater support for increasing the engagement with the left government even if this requires putting their agenda on hold for the time being, considering the changing political environment. The left government has agreed to revise the constitution but refused to make any particular commitment on particular issues or on the timeline. They said difference of opinion over the future course was the reason neither party officially defended the remarks of Province 2 Chief Minister Lalbabu Raut on constitution amendment. Addressing a civic reception organized in Janakpur in honor of Modi, Raut said that the Madhesi parties were continuing their struggle for amendment. Raut ‘s remarks drew strong reactions from the major parties as well as from Prime Minister KP Oli. FSFN Chair Upendra Yadav said constitution amendment was a must for any partnership with the left. He said his party would continue its struggle unless mistakes are corrected. “The constitution should be amended to accommodate the aspirations of all sides. We won’t join the government unless that happens,” said Yadav. FSFN has sought a revision in Article 274 of the constitution, saying that it should be amended so as to make it easier to redraw the federal boundaries in future.